The EGS separates heavy solids and oil from industrial wastewater and storm water using traditional gravity separation. Heavy settleable solids drop out of oily wastewater in the inlet chamber. In the separating chamber, the oil rises and lighter settleable solids fall. Free oils floating in the separating chamber are collected by a rotary pipe skimmer for collection and disposal. A sheen baffle retains residual floating oil as the treated effluent discharges through the outlet. Flow rates of 100 gpm to 700 gpm are handled in a single tank. The EGS using gravity separation to remove heavy solids and hydrocarbons from industrial wastewater, process water and storm water. In operation, this separator accepts industrial liquid waste in the inlet chamber where settleable solids fall to the bottom as sludge for periodic removal. AFL oil and solids separators are designed in accordance with American Petroleum Institute (API) criteria for liquid waste. The EGS is a pre-packaged, ready-to-install separation tank constructed of either fiberglass, stainless steel or carbon steel. 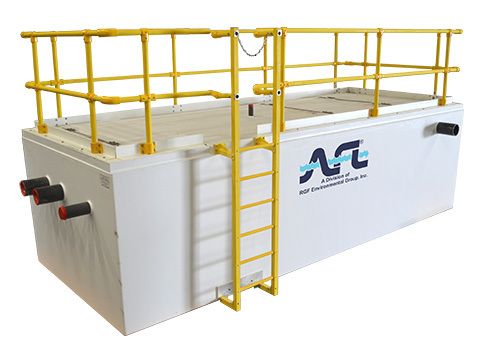 AFL’s dual-wall fiberglass tank offers the greatest durability and life expectancy with foam core, 100% composite once-piece molded construction. AFL’s EGS offers a robust, reliable oil and solids separation system with an operational life in excess of 40 years. Flanged immersion heater(s), which can be bolted directly to the tank. The heating system is thermostatically controlled. Weather and explosion proof enclosures are available for the various controls. A sludge ump-out system consists of a diaphragm pump, an enclosed control panel, wiring, and plumbing to the point of sludge origination. The pump used in these sludge handling systems is a self-priming diaphragm type. It pumps almost anything that passes through the suction line: sludge, mud, sand, and machining chips. Provide automated discharge of water from the outlet chamber of a separator. The transfer may be to a sewer system, waterway, drainage ditch or storage. Pump-out will be necessary when positioning of the separator in the installation will not permit gravity discharge of the effluent.